Print your logo onto these custom printed illuminate custom full colour notebooks a5 or one of our other innovative custom notebooks and use them in your next marketing campaign as a unique giveaway item. Illuminate Custom Full Colour Notebooks give you a uniquely full design of your own full colour notebook. This hard cover notebook is printed in Full Colour from the front to the back & spine. This notebook brings your brand to life with spectacular all over print, stand out! Paper:	160 pages, 70 gsm paper. Options: 160 pages Ruled, 160 pages Blank, Combination 96 pages Rules + 64 pages Blank. Elastic closure width:	Select: 6mm, 9mm or 15mm. Elastic pen loop width: Select: 6mm, 9mm or 15mm (elastic closure and pen loop must be same width). Elastic colours: white, black, yellow, green, red, orange, pink, purple, light blue, royal blue, navy (elastic closure and pen loop must be same colour). Ribbon colours: white, black, yellow, green, red, orange, pink, purple, light blue, royal blue, navy. Inside cover printing or pocket printing, is available at an extra cost. Price Includes an all Over Print, in Full Colour - front and back of notebook. Other innovative corporate gift ideas that could be suitable to create brand awareness include these cheap promotional Endeavour Soft Faux Leather Notebooks A5, quirky advertising gifts such as these Cheap Beta Notebook A5 with Pens or how about using one of our more bespoke custom made products such as these great quality A5 Coloured Note Books With Elastic? Custom brand these bespoke custom natural leather items or one of our best-selling promotional notepads and notebooks»custom notebooks with your company logo! 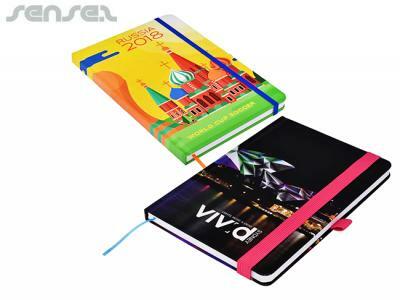 Personalise your illuminate custom full colour notebooks a5 or custom design custom notebooks for your marketing campaign. How can these unique promotional illuminate custom full colour notebooks a5 or our personalised custom notebooks fit in with your marketing strategy and help you maximise your brand exposure? Our custom made Illuminate Custom Full Colour Notebooks A5 can be produced from a minimum quantity of 250 pieces. We can have your logo branded on these corporate Illuminate Custom Full Colour Notebooks A5 in Full Colour Digital Print. A setup fee of NZ$170.00 will apply to make the film. The delivery time is 6 - 7 weeks from time of your order.